14 March 2013 started like any other day for Combined Task Force 151 (CTF 151)’s Battle Watch Captain, Captain Jonathan Liu RSN, and his Battle Watch Assistant, Military Expert 2 Lim Jiayee. 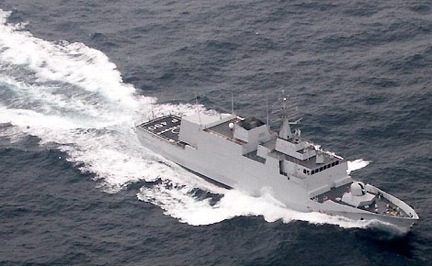 One week after assuming command of CTF 151, the Republic of Singapore Navy’s Battle Watch team was conducting routine checks with patrolling units and adjacent NATO and EU Naval Force (EUNAVFOR) Task Forces when they were alerted to a potential piracy incident off the northern coast of Somalia. A merchant vessel en route to Oman had reported four skiffs conducting approaches and acting suspiciously. The Battle Watch sprang into action, informing the Italian Navy patrol vessel ITS Cigalla Fulgosi and directing her to the reported location. At the same time, a Japanese maritime patrol aircraft conducting surveillance of the Internationally Recommended Transit Corridor (IRTC) was alerted to scan the area for suspicious activity. Capt. Liu and his team also worked with their opposite numbers within the NATO and EUNAVFOR Task Forces to organise a surface search of the area, and the suspected pirates quickly dispersed. The actions of the merchant vessel and prompt, well-coordinated responses of the NATO, EUNAVFOR and Combined Maritime Forces units showcase the working relationship between merchant shipping and counter-piracy forces operating in the Gulf of Aden. The threat of piracy remains clear and present in the Gulf of Aden despite a decrease in attacks in recent months. Counter-piracy forces remain alert to the threat, and are mindful of a possible resurgence after recent events and seasonal weather patterns combine to create an environment conducive to pirate activity. Last week the oil tanker MV Smyrni, which was seized by pirates in May last year, was released after her owners paid a substantial ransom. Analysts believe that a portion of the ransom money could be re-invested in pirate operations. Additionally, the period between the monsoons creates increasingly favorable sea conditions for the use of skiffs, the pirates’ attack vessel of choice. Skiffs allow them to blend easily with the local fishermen during the ongoing fishing season, while maintaining high mobility for opportunistic strikes on merchant vessels.